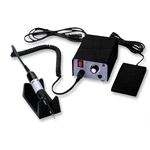 Electric nail systems and electric nail file machines reduce the time and tiresome effort that a professional manicurist inputs to do a set of acrylic nails or works with rough nails. Nowadays, a nail salon is not very functional if each technician does not have an electric nail system to proved manicure or pedicure sessions. Source One Beauty offers the right tools with the right price tag for your nail spa. So if you are shopping for nail supplies make sure you check what we have listed below – investing in the right nail machine will be the difference you see in the satisfaction your customers feel after a service you provide.